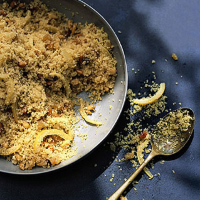 Put the couscous in a heatproof bowl and add the olive oil and ginger. Pour the boiling vegetable stock over the couscous, cover with foil and leave to stand in a warm place for 10 minutes. Cut the preserved lemons in half and discard the pips and flesh, then thinly slice. Add to the couscous with the pine nuts and sultanas. Stir well to mix before serving.